"Kimberley, that was so good to have the lesson with you - I feel much more comfortable with different movements that I had previously had difficulty with. And posture which I hadn't realised was a major fault with me, I feel much better!" "Hi Kimberley, I have to thank you for the lesson I loved it. You are not only a beautiful dancer but a very good teacher. Thanks so much for a great class and a wonderful performance at the end. I realise now that it must have been extremely tiring for you to have done both. But it was so lovely for us to see you dance." "You are born a teacher and have incredible skills to pass your knowledge onto others." "I did your Melbourne Turkish Workshop and loved it! 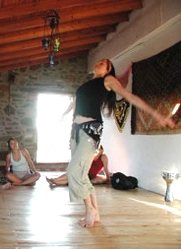 If you come to Australia again to teach let me know as I would love to do another Turkish dance workshop." "Kimberley's classes are the most exciting part of my week and I would not hesitate to recommend her to dancers at all levels. Her knowledge, ability, commitment and unique approach make her a guru in the field of dance." "Thanks to your great teaching I have learnt to dance with elegance which is a pretty special thing." "I absolutely treasure my memories of Turkey and especially our time dancing together. You are a wonderful teacher and I wish I lived half a world away so I could take classes more often. I really had to see the landscape; the beautiful olive trees, the hollyhocks, the heat, the Call To Prayer, and the amazing sunsets to really tie everything together into why it all makes you want to express it in dance. Thank you again for the choreography and for the most wonderful trip I've had in years." "At this late stage, may I say how much I enjoyed your workshop. You are an excellent teacher, and have certainly learnt your stuff. Your workshop was well structured and you are an excellent communicator. Best wishes for your return to Turkey, and I will look forward to your next workshop over here when next you come back. Thanks for putting NZ on the map in Turkey. Cheers." "I'm back and just wanted to say thanks for the wonderful lessons, I found your teaching really complete and precise more like a director, exactly what I was looking for! now I've got alot of material I can use and work on. Thanks!" "Kimberley - just wanted to let you know how much I appreciate the knowledge, passion and encouragement you passed on to us as your students. I learnt well the basics and particularly liked the way you broke each move down so we could understand what we were actually doing, feeling like I had made progress after each class. What you taught gave me a solid foundation to build upon. I'm now well on the way to my dancing goals thanks to the inspiration I draw from you as a teacher and performer." "Kimberley, the workshop on Saturday was awesome, thanks so much. I really enjoyed it, as did everyone else I talked to." "We are so excited about the upcoming workshop and classes." "Just wanted to say that the class this week was great - am really enjoying the inclusion of things designed to get the feel for the movement and the things that can be done - incorporating this into the warm up and warm down is fun. Thanks." "Hi Kimberley! Thank YOU for your amazing teaching! Have been raving to everyone about how much fun we are all having and how great our teacher is!!! Kimberley, I just wanted to say how much I enjoyed the Workshop on Saturday. It was GREAT!! I've already remembered the piece by just listening to the music and hearing what move should fit in with it - I am very happy with that!" "Just to let you know what a wonderful teacher you are - very inspiring, positive and encouraging"
"What a wonderful workshop. Congratulations!" "Sad I have to leave because I think you are a great teacher. I learned more from you than in the whole 2 years before and I really want to say thank you for that!" "As a relative newcomer to this form of dance, I was delighted to experience Kimberley's style of teaching. Having already enjoyed beginner classes in the UK where I gained the basics, I was able to look at how I can polish these moves and incorporate new moves freely and without inhibition. Kimberley pushes the boundaries in teaching this particular style of dance by focussing on a dancers posture and how this can affect each move. As is the case in all things in life, get the foundations right and the monument will remain standing for centuries to come. Kimberley achieves this by making sure a dancer re-focuses mentally and physically on the root cause of a movement and mental motivation, in order to achieve a sustained and eye-catching performance." Kimberley I would like to say a special thank you for the classes you have provided us. You have such a special teaching talent, apart from dancing I learnt such a lot observing the way you encouraged and helped us all with your amazing approach. How privileged we are to have had this opportunity. While I was so scared to even get on my feet and couldn’t hear the music or even remember what to do and I think we did everything double time instead of slowly I was still able to appreciate the sharing and well almost sacredness of the evening last night, if I may say so. Once again, thank you for making it so. I am still dumbstruck at your amazing dance – something never to be forgotten. Wow. Thank you for your classes. You have an amazing teaching talent. Hi Kimberley, Really enjoyed the workshop last Sunday….. DESPITE being the least experienced dancer. Once again, thanks so much for the workshop….. great teaching style – with humour thrown in. I have had an amazing time dancing and learning with you. I also want to say thank you again for being part in your class. I really enjoyed your teaching style and to experience the first steps of belly dancing. Thank you. "That was a very energetic and fun workshop. Has inspired me to continue belly dancing... I bought your DVD and you look great."